Manuela Mordhorst was born and raised in Bonn, Germany in 1970. From 2009 on she was working in her practice for holistic healing and as an independent artist. by her italian and Sylt island roots, and by her father who is artistically very talented in painting, mottle and gild. The artist is married, lives and works close to Hamburg, Germany. Regularly she participates in national exhibitions. To this very day, I foster a deep love of intensive colours that remind me of my Sardinian and Sylt island roots, of the sea, the sky, the sun, the sand, of the joy of life, of intensity. I have always been interested in the diversity of art, colours and shapes, in the unification of different materials and picture supports. Nature and the feelings it triggers is for me both a paradigm and a source of ideas. Structures, surfaces, shapes, colours and patterns seem to offer countless possibilities of combining. They provoke me to try out more and more, to transform experiences and feelings and to set them in art. All in all, my focus lies on creating pictures that tell the beholder something, but which also may offer room for quiescence. Complexity, inconstancy and the insatiable interest in shapes and colours are elementary aspects of my painting. It also forms part of my self-unfolding and self-awareness as a freelance artist. The key materials here are self-produced structure pastes and pigments as well as natural and non-chemical painting materials that create a certain feel that can be immersed into. Besides my freelance work that mostly deals with island themes and the elements, I also offer customized contract work. This is meant to blend into the various living and working spaces so specifically making them in the first instance blend in, harmonize and completive rather than striking. My fine arts roots and the element of music are important parts of the creative process that flows into my works. And thanks to the ever-increasing dealing with the topics of holism, spirituality and energy in my practice (for holistic healing), from 2009, painting also became to me a means of intensive introspection. Spiritual and emotional worlds, dealing with one’s self and one’s own inner structures as well as process work that reveals an understanding of the complexity of the soul and one’s simple existence have by all means been the foundations of my works until this day. To integrate, to discover, to change and to make visible what is happening in and around people, how life and its experiences are perceived, continues to be a topic, is also a stimulus for new works, new pictures, simply for new pictures of life. such as stone, ceramic, metal, wooden and canvas that characterize the various life structures and make them so interesting for the intuitive artist. It is about making emotions, deeper searches for meaning, uncovering but also solving that can be shown in her work in different ways. 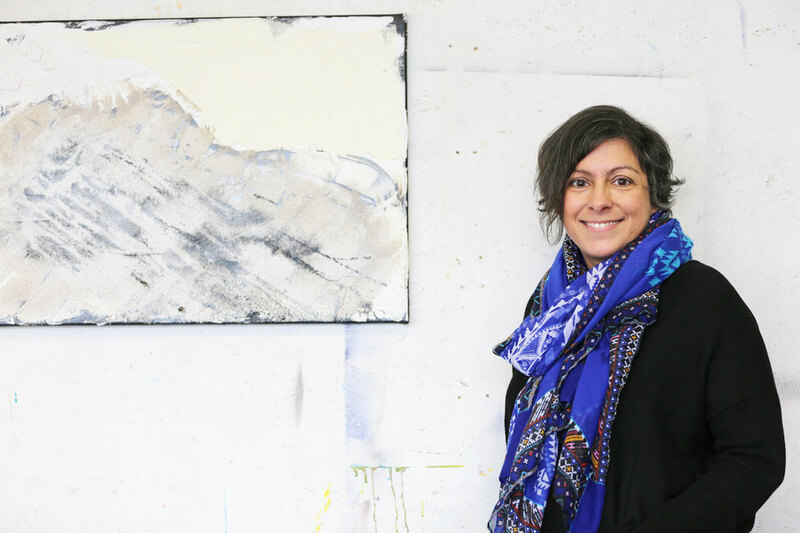 The artist obtains much inspiration and stimulus from music and from nature, from island landscapes, various holiday destinations that she does not copy one-to-one artistically but rather emulates the emotions and energies of the places that she perceived herself. When doing so, she cannot concentrate on only one medium or only one linear style or colour, but needs the perpetual possibility to try out colours, styles and materials and herself to thus develop herself consequently further. In this way, her pictures invite you to bustling joy of life and liveliness as equally as to contemplative consideration.